The designer of Timeless deck and Butterfly deck made for RSVP Magic decided to propose people his own project – Bicycle Venexiana Playing Cards. “Venexiana” – this is how the word “Veneziana” is written in the area of Veneto, in northern Italy. It’s familiar but at the same time strange, exactly as Venice itself. Venice is not just a beautiful city. It’s an impossible invention of time. Inspired by designer’s love for this aged beauty, “Venexiana” recalls the elegance, playfulness and mystery of early 18th century Venice. 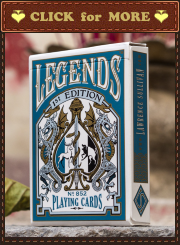 It’s a completely custom deck, and every element, from pips to courts is entirely designed by Lotrek (the designer and owner of Half Moon Playing Cards). 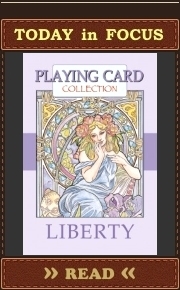 It is planned to be printed by USPCC. Venice (Venexia) is a city in north-eastern Italy. It is located on a group of 118 small islands separated by canals and linked by bridges – in the marshy Venetian Lagoon which stretches along the shoreline. Venice is world famous for the beauty of its setting, its architecture and its artworks. The city in its entirety is listed as a World Heritage Site (along with its lagoon). The name comes from the ancient Veneti people who inhabited the region by the 10th century BC. Venice historically was the capital of the Venetian Republic. It has been known as the “La Dominante“, “Serenissima“, “Queen of the Adriatic“, “City of Water“, “City of Masks“, “City of Bridges“, “The Floating City“, and “City of Canals“. The leader and ruler of the city of Venice and later the Republic of Venice was the Doge (it descends from the Latin “dux” meaning “leader”). Doges of Venice were elected for life by Venetian aristocracy. Commonly such person was one of the shrewdest elders in the city. Despite the great power given to them, the Venetian Doges were restricted by law to spend the rest of their lives inside the Doge’s Palace complex (see the artwork by Canaletto below) and St Mark’s Basilica. They could leave those buildings only for diplomatic reasons. Ludovico Manin (1789–1797) was the last Dodge of the Republic. The symbol of the Republic of Venice (it is still the symbol of the city of Venice) was the Lion of Saint Mark. It represents the evangelist St Mark and is pictured in the form of a winged lion. The Republic lost independence when Napoleon Bonaparte conquered Venice in 1797. The French conqueror brought to an end the most fascinating century of its history. During the 18th century, Venice became one of the most elegant and refined city in Europe, greatly influencing art (the most famous artworks by Tiepolo and Canaletto), music (the city is the birthplace of Antonio Vivaldi, 1678 – 1741), architecture and literature. Canaletto’s painting of the Bucintoro in its 18th century returning on Ascension Day. The Carnival of Venice is one of the most known phenomenons of the Republic. Masks have always been a main feature of it. Venetians were allowed to wear them quite a long period of a year due to several festivals and holidays. And they enjoyed that in full as masks gave people anonymity and servants could be equal with their masters. Commedia dell’arte is another phenomenon closely associated with the Carnival of Venice. A lot of historians assume that the commedia’s genesis may be related to the Carnival. Commedia dell’arte is a form of theater characterized by masked “types” which began in Italy in the 16th century. It was responsible for the advent of the actress and improvised performances based on sketches or scenarios. The closest translation of the name is “comedy of craft”. The characters of the commedia usually represent fixed social types (stock characters) such as foolish old men, devious servants, or military officers full of false bravado (Capitan Scaramouche). Napoleon handed over the administration of Venice to the King of Austria later in 1797. The Carnival was outlawed entirely in that year and the use of masks became strictly forbidden. “Venice throughout the centuries has been a source of inspiration for numerous artists. From Canaletto’s paintings , to Hugo Pratt’s “Corto Maltese”, and from the Byzantine refugees after the fall of Constantinople in 1452 to the stunned tourists of today, this seducing city has generated and hosted endless dreams. Every person has found something here. Mystery, beauty, elegance, forbidden love, game, crime. All these are elements of the city, incorporated in its’ traditions. Commedia dell’ Arte, the old Italian form of improvised theater, holding hands with the Carnival. Endless wealth and power, bearing death and destruction, but also giving birth to immortal monuments of Art and Music. In this deck I tried to depict my vision of the city. It’s inspired by the 18th century period, which had been highly controversial. It was the time when Venice reached a peak in artistic power and elegance but at the same time it was the last century of the “Serenissima”. The Republic of Venice, had already lost the leading role in the sea trade and Napoleon finally conquered the city in 1797, three years before the end of the century. Having all these elements in mind, along with memories of my winter walks in the empty narrow streets, between the sparkling sinking palaces, I have designed this deck. I didn’t want to focus only on the Carnival, though it’s a very characteristic aspect of the city. So, for the courts I’m using people in carnival costumes, along with prominent citizens of Venice such as Ludovico Manin, the last Doge, Carlo Goldoni, the great playwriter, Casanova, the notorious womanizer and Antonio Vivaldi, the composer of the “estro armonico” , the “Harmonic Inspiration” . Should be printed by the United States Playing Card Company. 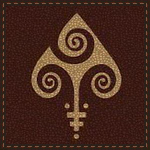 Now, you can try to find them on the official site of Half Moon Playing Cards. These cards are refined, stylish and subtle – a truly great deck, exhibiting a real understanding of card design. Perfect deck.